Architecture, technology, history, and the human body come together in this near-supernatural conjuring of the spirits of the Radio Canada International shortwave radio towers. Requiem for Radio: New Dead Zones is an interactive installation about the disappearance of shortwave radio transmissions. It is a requiem for the Radio Canada International shortwave site that was located near the border of New Brunswick and Nova Scotia and transmitted shortwave radio around the world from 1944 – 2014. In radio terminology, a dead zone is an area where radio signals cannot be received due to propagation difficulties. With the RCI site gone, there are now a lot more dead zones in the world, not due to interference, but rather because the transmissions have ceased. This interactive installation involves 13 towers with copper capacitance sensors positioned around the space to create a scale model of the recently demolished RCI site. Each tower is dedicated to one of the radio towers that stood there. The towers are placed in relation to one another exactly according to the placements of the original radio towers, and their heights are built to the scale of the height of the tower they represent. 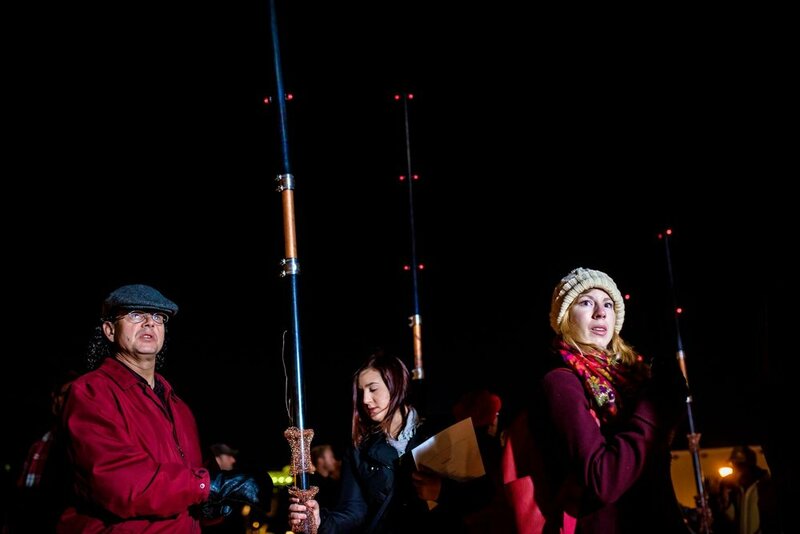 The public is invited to walk among the scale model of the site and to touch the towers and to trigger the sounds of the RCI towers – using capacitance and human touch to play the ghosts of the radio towers. Each copper sensor on each tower in this installation is connected to a small microcontroller which sends a wifi signal to a mac mini running a program in supercollider that then triggers the audio recording of that particular tower and sends the signal to the speaker at the base of that tower. The audio samples that are played, are recordings that I made of the towers in 2013 by placing contact microphones on the base of each of the RCI radio towers. Each tower stood hundreds of feet tall in the high marsh winds like giant guitar strings, and by placing contact microphones at the base of each tower, I captured beautifully complex and haunting drones replete with undulating harmonics and subharmonics. Each tower had its own distinct voice and sound, and therefore each theremin will trigger the specific sound recording of the tower it represents. These recordings were then filtered with a hum remover used in reverse in order to focus on a primary frequency (and it's related harmonics) for each tower, so that each tower becomes a specific note in a chromatic scale, from C3 to C4. 13 towers, become 13 notes of a chromatic scale, from tonic to tonic, so that the installation can essentially be played like a musical instrument. The result is an installation that stands glowing red and silent when no one is touching it. But if one individual touches one tower, only one drone will be heard, but if thirteen people are touching all 13 towers, a choir of 13 drones will be heard. With enough people working together, chords and melodies can be played on them as well. The electrons from the human bodies pass through to the tower by touching the copper pads, and trigger the sound recordings (the ghosts) of those historic radio towers in a choir of drone songs.